Making stir fried dishes comes pretty easily for me without the use of recipes. It's just a matter of throwing in whatever you have, adjusting the seasonings to taste and serving it over rice. But I wanted to branch out and try some different recipes in my Instant Pot, especially ones that incorporate untraditional ingredients. This recipe involves a marinade made with soy sauce (or tamari for those gluten free), white wine, honey and garlic. The wine in the marinade intrigued me and it came out delicious. For this recipe, I used fresh green beans and I don't recommend substituting frozen unless you absolutely have no choice. The fresh beans really add nice texture and vibrant color after they have blanched briefly before cooking. Not a fan of green beans? You can also substitute with fresh snow or snap peas too. The original recipe called for sliced red bell pepper. I didn't have any on hand but I assume it would be delicious and would add a nice pop of color to the dish. 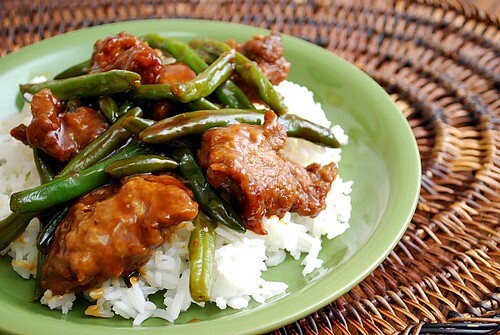 If anything, you can use your favorite mix of stir fry vegetables in this recipe but the key is the marinade and beef. This would also go well with the use of chicken, pork or even shrimp. Press SAUTE on the IP and add 1 tablespoon sesame oil; heat until shimmering. When hot, Add drained steak to IP and sauté until almost cooked through, about 2 to 3 minutes. Add 1 cup beef broth to the IP. When the IP has beeped after pressure cooking for 7 minutes, turn the setting on top of your IP to VENTING. Doing so allows the IP to quickly release any remaining pressure (also known as QPR or QR). I use a wooden spoon to carefully turn the setting to avoid close contact with the potential steam. You may also want to turn your IP away from cabinets to allow the released steam to escape freely. The pin at the top of your IP will drop when all pressure has been released and it's safe to open. Press SAUTE and add the remaining tablespoon of sesame oil to the IP, onion and green beans. Cook until vegetables are crisp-tender, about 2 to 3 minutes. Stir in the reserved marinade and add to the IP. Stir until sauce thickens and coats meat and vegetables, stirring constantly, about 2 minutes. Adjust seasonings to taste with salt and pepper; serve over rice. Beef broth isn't listed in the ingredients, but is mentioned in the instructions. ??? When cooking in the Instant Pot, you always need at least 1 cup of liquid before sealing. 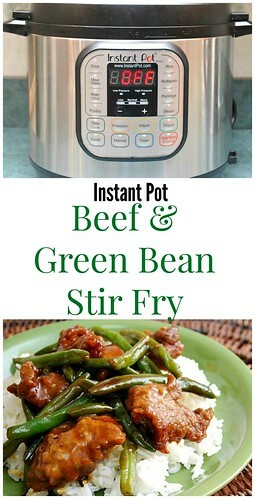 In this recipe I used beef broth but you can also use 1 cup of water. I’ll update the ingredient list to reflect the mandatory cup of liquid.